Your pancreas is a narrow organ, about 6 inches long, that lies behind the stomach. The pancreas produces a hormone called insulin that regulates the amount of sugar in the blood. It also makes enzymes that are released into your small intestine and help to digest food. Failure of your body to regulate the amount of glucose in your blood causes Diabetes. In Type 1 Diabetes the pancreas produces little or no insulin. In Type 2 Diabetes, your pancreas produces insulin but your body is not able to utilize it efficiently. Pancreas transplantation should be considered an acceptable treatment option for Type 1 diabetics with kidney failure who have had or plan to have a kidney transplant. The successful addition of a pancreas transplant will restore normal glucose control, does not jeopardize patient survival, and may improve kidney survival. 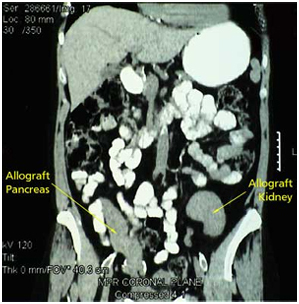 In the absence of indications for kidney transplantation, pancreas transplantation should only be considered in insulin dependant diabetics who have a history of frequent acute, and severe metabolic complications requiring medical attention, such as frequent episodes of hypoglycemia, ketoacidosis, or hyperglycemia. Pancreas transplantation (PTX) is a surgical procedure in which a pancreas from a cadaveric donor is placed in the body of the recipient. It is most often performed as a whole organ transplant (with a portion of accompanying duodenum). Patients with Type I Diabetes Mellitus and advanced chronic renal failure or who are on dialysis are candidates for pancreas transplantation, often in combination with a kidney transplant. Type I diabetic patients who have previously received a kidney transplant may be accepted for pancreas transplantation. Simultaneous pancreas and kidney transplant (SPK) is a transplant procedure where both a kidney and the pancreas are transplanted at the same time from a cadaveric donor. For those suffering from Type I diabetes and renal failure, this procedure allows freedom from dialysis and insulin dependency. The procedure takes approximately five to eight hours for both organs together, and most patients are hospitalized for one to two weeks. 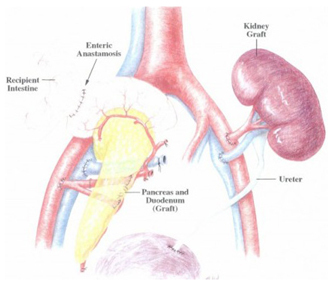 A Pancreas After Kidney transplant (PAK) is a procedure where patients who have received a successful kidney transplant would subsequently receive a pancreas transplant. This procedure is performed on patients with Type I diabetes and are receiving immunosuppression. A patient with a previous kidney graft, or with the opportunity to receive a kidney from a living donor, can proceed first with the kidney and then wait for a cadaver pancreas. A Pancreas Transplant Alone (PTA) involves transplanting a pancreas from a cadaveric donor to a patient whose kidneys have not yet been affected by diabetes. It is performed on patients with Type I diabetes who are extremely brittle and/or challenged with significant and frequent hypoglycemia unawareness, or in cases where the risks of surgery and potential side effects of immunosuppression are better than the current state of health. To qualify for a pancreas alone transplant, candidates must be experiencing great difficulty in controlling glucose levels or experiencing other complications of diabetes. PTA's are the least common pancreas transplants. Insulin independence with normal or near normal blood sugars. Prevention of the development and/or progression of the long term complications of diabetes. Improved quality of life, elimination of dietary restrictions. The evaluation process is similar to kidney transplant evaluation. However patients requiring pancreas transplant may need additional testing such as cardiac catheterization and consultation with endocrinologists and vascular surgery. Pancreas transplant surgery is more complex and extensive than a kidney transplant. The pancreas transplant is placed intra- abdominally through a vertical mid-line incision about 8 inches long, as opposed to a kidney which is placed in the retroperitoneum (behind and outside your peritoneum). SPK surgery will last about 5-8 hours and a PAK or a PTA surgery usually takes 3-5 hours. 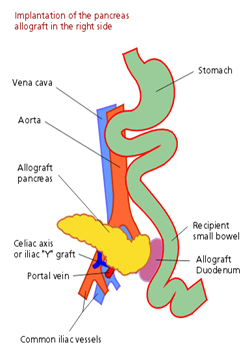 The new pancreas is transplanted with a portion of small intestine which drains the digestive enzymes of the pancreas. This will need to be connected to your small intestine or your urinary bladder to provide a drainage for the enzymes. 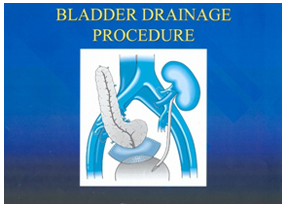 At We Care India partner hospital we prefer the former method as it is more physiological and does not harm your bladder. Your own pancreas will not be removed during the surgery. Transplant options for the diabetic recipient include whole organ pancreas and islet transplantation. Islet transplantation offers the advantage of being less invasive than whole organ transplantation. However, current experience shows that multiple transplants are required and long-term function remains poor. Early successes with single donor islet transplants were encouraging but insulin independence is usually not sustainable.